instrument…an instrument of love and reconciliation. 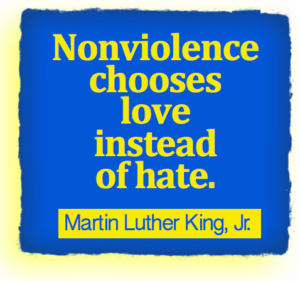 earth and to follow Jesus’ teaching on love, compassion and nonviolence. 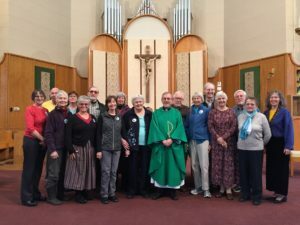 Today’s World – the Sacred Awaits Us” by Jean Stokan, Coordinator for Immigration and Nonviolence for the Sisters of Mercy of the Americas in Washington, DC. 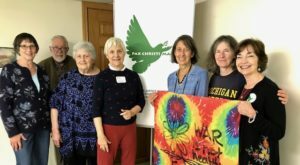 Over 30 people gathered from all over the state to hear Jean’s presentation on her work with people living on the margins in Latin America, Appalachia and inner city Washington, DC. Through moving images, music, stories and her powerful poetry, Jean brought us closer to people who experience the violence of abject poverty, endless war, oppressive immigration policies, and other human rights violations. Through the lens of Catholic Social Teaching, particularly the ‘Preferential Option for the Poor’ and ‘Solidarity’, we reflected on how Jesus is being crucified today and how we can work to change the oppressive structures of violence in our communities and across the globe. repressed and denied their dignity historically – and to find ways to support them. 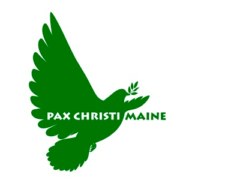 She urged us to remain alert to the hope and opportunities for change offered by Pope Francis and the positive view of him throughout the world. over brunch. 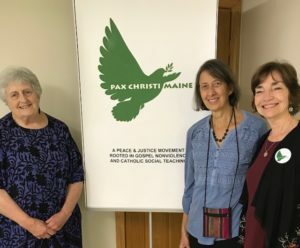 Pax Christi Co-Coordinators Denny Dreher and Mary Ellen Quinn, PCM Council member Mary Kate Small, and others provided retreat materials, organized meals and hospitality, and the Sisters of Mercy of the Americas graciously assisted with hospitality and local transportation for Jean Stokan in Maine.